Scroll down for a free printable Map Of Louisiana Parishes, along with another map showing Louisiana cities. 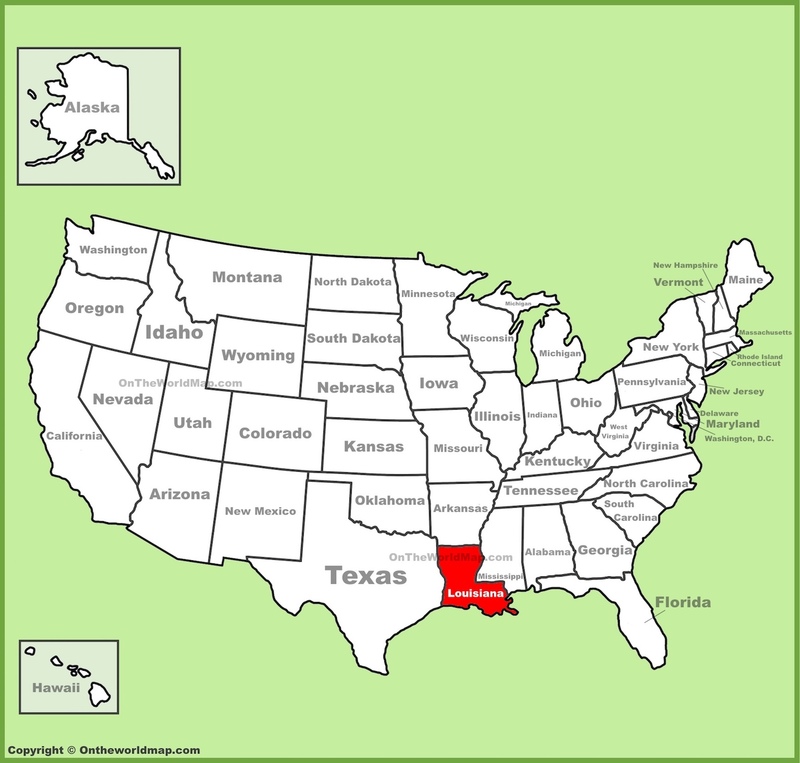 The above US map shows the location of the state of Louisiana in relation to other US states. On April 30th of 1812, Louisiana became the 18th state admitted to the Union. Scroll down for fascinating facts about the state of Louisiana, and related links to other free printable items. 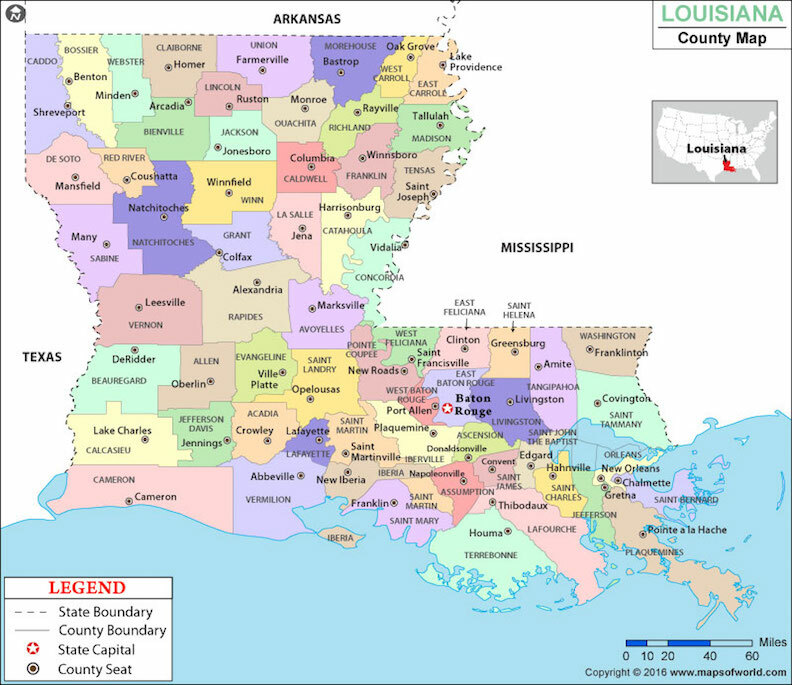 Louisiana is the only US state whose political subdivisions are known as "parishes" instead of counties. The St. Charles Street Car is a national historic monument, in continuous service for more than 150 years. In the 18th and 19th centuries, the Treme neighborhood of New Orleans became one of the first places in America where people of color were allowed to own land. The city of New Orleans is 8 feet below sea level. Louisiana is home to the Creole people. Their lineage is French and Native American. They have their own unique cuisine (Cajun and Creole) and their own style of music (Cajun and Zydeco). New Orleans is the birthplace of Jazz music, which is one of America's greatest contributions to the art world. In fact, the great jazz musician Louis Armstrong was from New Orleans. The first opera in the United States was performed in New Orleans in 1796. The official colors for the Mardi Gras celebration have meaning: Purple stands for Justice, Gold stand for Power, and Green stands for Faith. The Lake Pontchartrain Causeway is the longest continuous bridge over water in the world, spanning nearly 24 miles. Tabasco sauce was created in Avery Island, Louisiana, back in the 1860s. Louisiana cities and major roadways. Shown above: A printable Map of Louisiana Parishes.